Today (Wednesday) was my last day of my 6-week skate ski program. While I will miss meeting up with this fine group of women and my awesome instructor, I have to say I’m happy to get my Wednesdays back. That, and I look forward to not being completely wiped out at the end of a long day of skate skiing and drills. 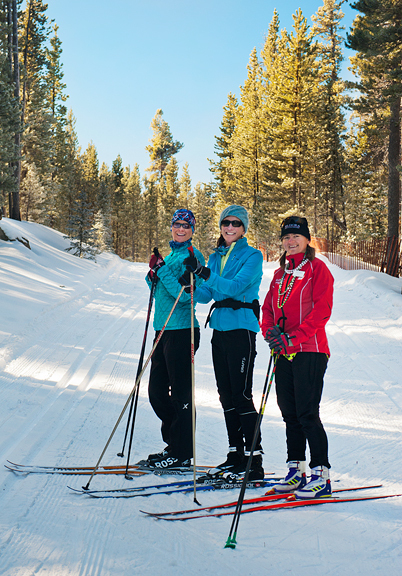 I signed up for this program to jump start my introduction to skate skiing. On the registration form, I was asked to mark my ability level, so I checked off “Green: Beginner”, because that’s what I was. Little did I expect to be grouped into the intermediate class. I came into this program with the willingness to work hard, but this level of instruction required even more than I had anticipated. So I worked. Hard. It wasn’t enough to just show up to class once a week, I needed to practice several times between classes so I could improve and take full advantage of the instruction I received. In the beginning it was crazy frustrating trying to piece together all of the elements of the technique while being completely exhausted from the hills. But I stuck with it as punishing as it felt, and within a couple of weeks I noticed some improvement. I am by no means what I consider a proficient skate skier, but I feel like I can practice and skate toward that goal equipped with the knowledge and understanding that our instructor shared over the last month and a half. After a day of skating up and down the hills at Eldora, it’s necessary to come home to an easy menu. I’ll tell you what, though – I think easy menus are perfect just about any time. We gave up going out to dinner on Valentine’s Day over two decades ago, opting for a delicious home-cooked meal in the privacy of our own home. This spared us the headache of having to jostle among crowds of couples with unreasonably high expectations for the evening. When I tried this recipe, my intention was to shoot for “easy”. Only after sitting down to eat our dinner, did I realized how a simple porcini butter could transform a meal into a swoon-worthy experience. 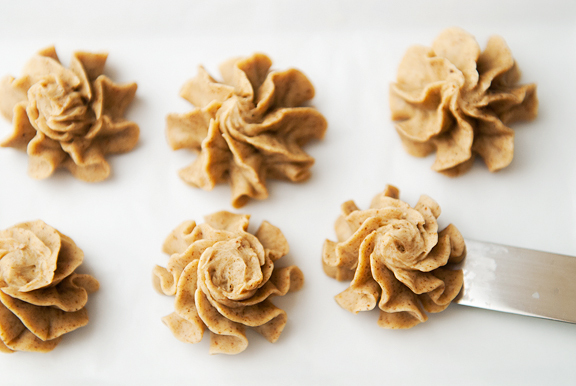 The name, porcini butter, is practically the recipe itself. 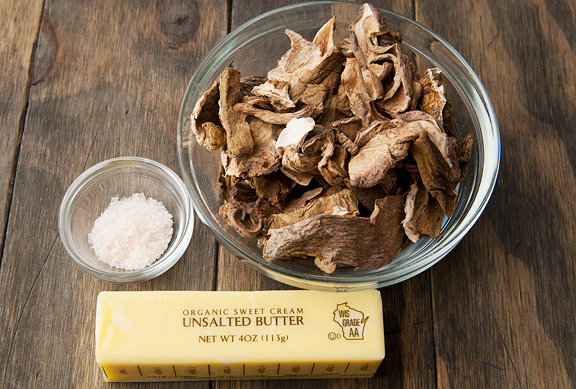 It requires dried porcini mushrooms and butter – a match made in heaven. If you are using unsalted butter, you can opt to add salt. I personally hold off on adding salt because I like to add it separately. Unlike fresh porcini, dried porcini are mush easier to find in grocery stores if you don’t have your own. They are usually packed in 1 oz. bags or containers. 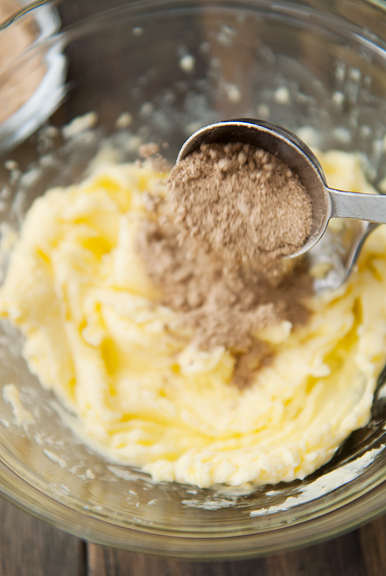 The butter should be at room temperature so you can cream it easily with a fork. 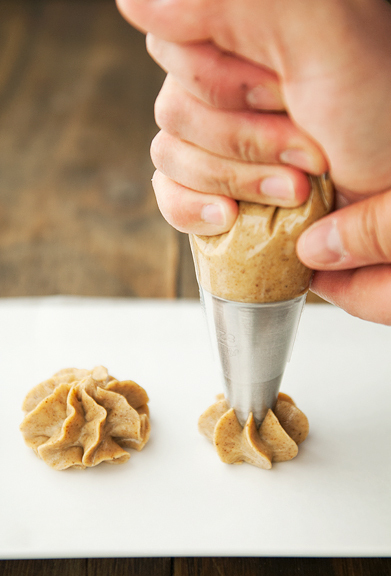 Use a spice grinder or a mortar and pestle to turn the porcini into a fine powder. Everything will start to smell of porcini at this point. An ounce of dried porcini is roughly equivalent to a cup of dried porcini. 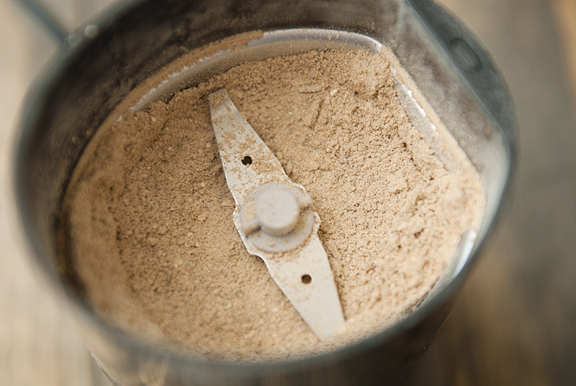 When ground, it yields about a third of a cup of powder. 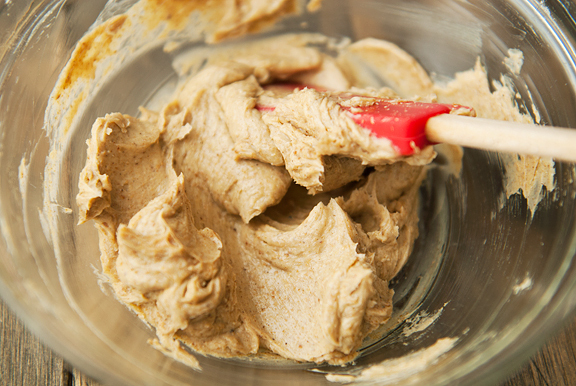 Mix a tablespoon and a half of the powder into a stick (4 ounces) of butter until it looks like creamy peanut butter. If using salt, this is a good time to add it. Leftover porcini powder is not a bad thing. You can save it for other uses or mix it with sea salt (2:1 salt to porcini powder ratio). Once the butter is blended, roll it up in wax paper to make a log or pipe it onto wax paper for fancier presentation. Refrigerate the butter to firm it up. We grilled steaks and decided to slap a pat of porcini butter on top. Decadent, I know. Originally, I had planned on filet mignon which benefits from the added fat since the cut is so lean. 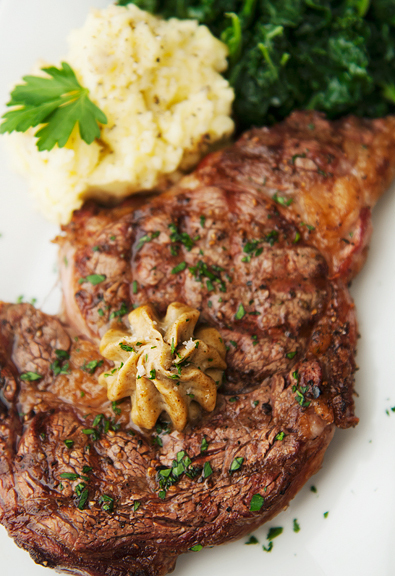 But after talking with the butcher, he and I both agreed that there is nothing wrong with serving a potent compound butter on a juicy, marbled rib-eye. Sprinkle some flake sea salt on top and what a heady combination! Porcini butter isn’t limited to steaks – try it with eggs, potatoes, pasta, fish, roasted chicken (rub it under the skin), bread, roasted vegetables, anything you can think of. Simply delightful. 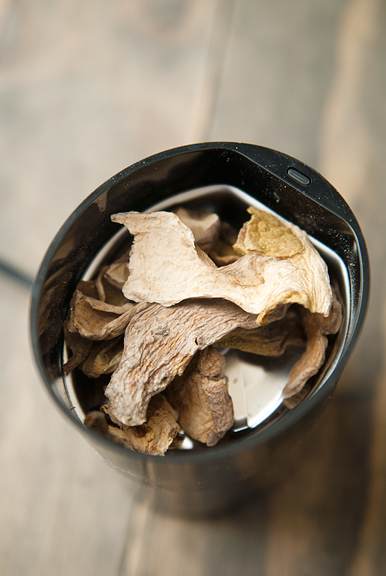 Place the dried porcini in a spice grinder (or use a mortar and pestle) and grind it into a fine powder. 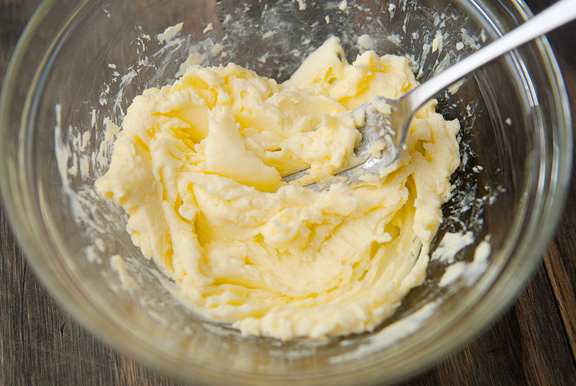 Cream the butter in a small bowl with a fork until smooth. Stir the porcini powder into the butter until uniform in color. Stir in the salt, if using. Place the butter on wax paper and form into a log with a 1 1/4 inch diameter. Wrap the log and refrigerate for an hour. Slice the log with a dry, warm knife. Or pipe the soft butter with a large piping tip onto wax paper and refrigerate until hard (about 30 minutes depending on size). Makes 8 tablespoons of porcini butter. 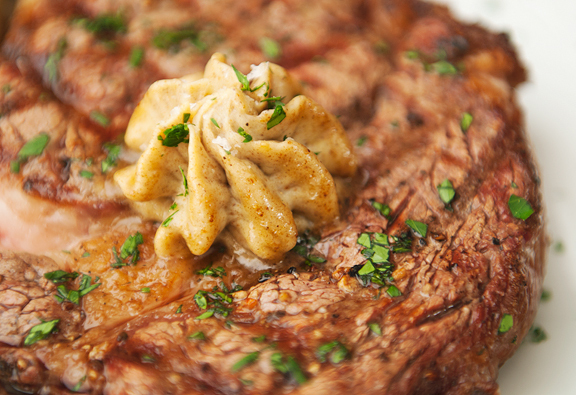 I used to think my dad was nuts for putting butter on steaks, but compound butter makes sense! I won’t tell you some of the other crazy food things he does. I’m amazed he has no cardiac issues. Congrats on your new ski skills! You are simply marvellous. Thank you. You should check out Mario’s Porcini Mustard. Yet another way to elevate a simple kitchen ingredient. I love to sprinkle mushroom powder over pasta as one would parmesan. I love basil butter on my steaks. No need of salt because the basil gives it a salty taste. I am definitely going to try this recipe. How do you think it would do with morels? I have a pkg. of dried morels that I have been wanting to use. 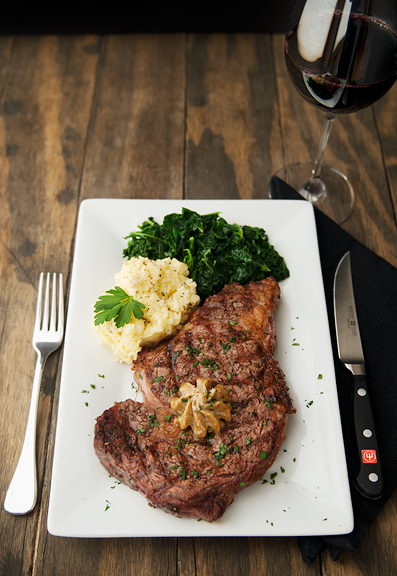 I am planning on making some big, fat steaks for V-Day, and now I officially know what I’ll be pairing with them :) Thanks for the recipe! TPH would have loved this on his ribeye! Darn, I’m reading this 2/18!! Susan – wow, that sounds good. Charlie – I’m not sure about morels as I haven’t had them dried and ground. But I think if it smells good to you, then give it a try! I realize this is a fairly old post… but I had to ask. This looks delicious, but I don’t have a spice grinder, and I don’t think I can justify the expense of one at this time. What could I use instead to get the dried porcini all powdery? Noelle – I think you could try using a mortar and pestle (but that would make me crazy to do by hand). Alternatively, you can order powdered porcini from places like Savory Spice Shop who does online orders, too.